Gain instant access to information on more than 60 chemicals! 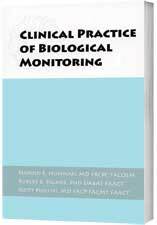 A practical and clinically relevant guide to selecting and interpreting the appropriate tests for biological monitoring. Covers human exposure to inorganic, organic, and organometallic substances from industrial and environmental sources. Includes a description of occupational and environmental toxicology basics as well as biological methods and objectives. Details both the advantages and limitations of biological monitoring, including practical pre- and post-analytical considerations. Methods for assessing exposure are outlined and augmented with figures and tables.